Current HSA Students’ Re-enrollment Period- Now to Friday, January 25! 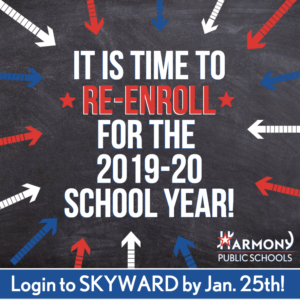 It is time to re-enroll for the 2019-2020 school year! Login to Skyward by Jan. 25th! https://harmonypublicschools.network/hsalubbock-new/wp-content/uploads/sites/124/2017/10/HSA-Lubbock-white-letters-300px.png 0 0 ssouthard https://harmonypublicschools.network/hsalubbock-new/wp-content/uploads/sites/124/2017/10/HSA-Lubbock-white-letters-300px.png ssouthard2019-01-14 15:00:122019-01-14 15:10:49Current HSA Students' Re-enrollment Period- Now to Friday, January 25!